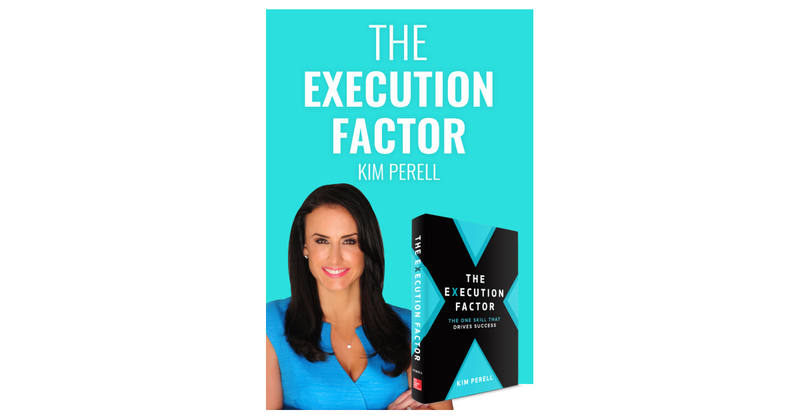 NEW YORK–(BUSINESS WIRE)–Entrepreneur, angel investor, and global marketing technology CEO Kim Perell announces the publishing of her book, The Execution Factor, The One Skill That Drives Success, on September 10th, 2018, by McGraw Hill. In The Execution Factor, Kim will take you through a step-by-step process of mastering execution for success in business and life. This book is a must-read for entrepreneurs, executives, employees, or anyone looking to take their life and career to the next level. Kim has made headlines for her transformative story as a startup entrepreneur to CEO of a leading global technology company. Laid off from her first job out of college at an internet startup that went bankrupt, Kim began her journey as an entrepreneur from her kitchen table. After borrowing money from her grandmother to start her first venture, Kim grew her start-up to a company with over $100 million in revenue. She went from broke and unemployed to selling her first company and becoming a multi-millionaire by the time she was 30. Kim sold her last company for $235 million in 2014. Kim attributes her success to her ability to execute and believes execution is a skill that can be learned. An active angel investor, Kim’s passion is supporting others to achieve success and she is an early stage investor in over 70 start-ups, 14 of which have been acquired. Execution is the skill she looks for in the people she hires and the entrepreneurs she invests in. The Execution Factor is for anyone looking to achieve success. It is a step-by-step guide to mastering the skill of execution and serves as a coach by your side. What Kim discovered in her years of experience is what differentiates success from failure is the ability to execute. Her stories are both inspirational and educational for future business leaders. After completing this book, you will have the knowledge and power to turn your dreams into reality. By mastering execution, you will have a clear path to success and a roadmap to achieve your goals. The Execution Factor is available for preorder at Amazon.com and BarnesandNoble.com. You can take Kim’s free success test here and visit kimperell.com to learn more. Kim Perell is an award-winning entrepreneur, executive, angel investor, and CEO of a global marketing technology company. Laid off from her first job at an internet startup, Kim began her journey as an entrepreneur from her kitchen, becoming a multi-millionaire by the time she was 30, and selling her last company for $235 million in 2014. Kim has been named one of AdAge’s Marketing Technology Trailblazers, Business Insider’s Most Powerful Women in Mobile Advertising, is an Ernst & Young Entrepreneur of the Year, and has been profiled Kim has been profiled by CNN Money, The New York Times and Forbes. Kim’s passion is to help others achieve success and is an early stage angel investor in over 70 start-ups, 14 of which have successfully been acquired by some of the largest Fortune 500 companies. Visit kimperell.com to learn more and follow Kim on Instagram and Twitter @KimPerell.